Hi friends, have you ever wondered why your yogurt doesn’t fill you up for breakfast? In this post I explain how to fix this, how to keep your sugar in check, and what you can do for a time-saving bowl hack. 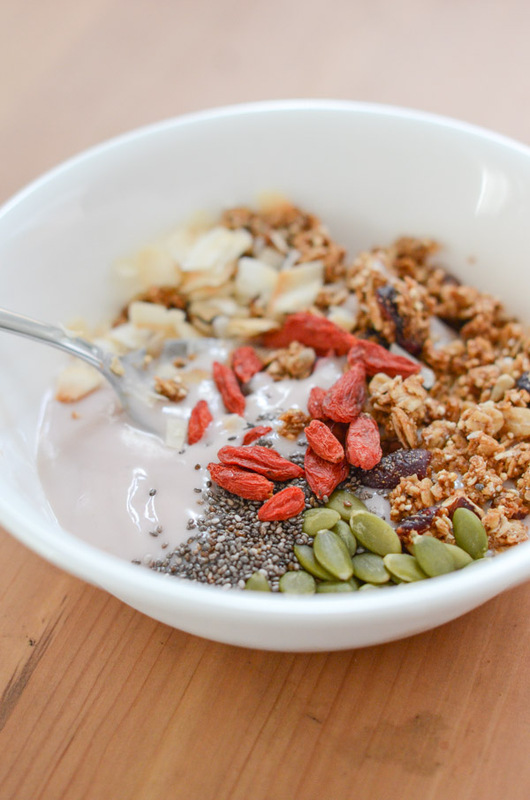 In general, you can easily make it more filling and also take the nutrition to the next level by converting your basic yogurt to a 2 Minute Yogurt Breakfast Bowl. And I say “bowl” lightly. I’ll explain below! We’re all different in terms of what and how much we need to eat to fill up. So I’ll try to keep this general. Especially if you aren’t eating a Greek yogurt that typically has more protein, yogurt on its own will likely not fill you up as a meal. Most individual yogurts I’ve seen contain roughly 100-200 calories. While calories alone aren’t an indication that you’re eating enough, I’ve personally found that it’s not enough for me. Additionally, some yogurts are lower in fat and protein, which can also impact satiety. I’ve been opting for coconut milk yogurts these days. While delicious, these guys are actually the least filling of any yogurts I’ve eaten before. So, if you’re wanting to eat yogurt for breakfast, you may want to try taking it to the next level by making it a yogurt breakfast bowl. As in add some toppings. You can take your yogurt to the next level by adding some healthy toppings that are delicious, but also filling. It literally takes me about 1-2 minutes to sprinkle all of these on to make this a delicious 2 minute yogurt breakfast bowl. I’ve been loving the Unsweetened So Delicious coconut milk yogurt. This has 110 calories, <1 gram sugar and <1 gram protein. Pour this into a bowl or give your yogurt a stir in the cup it came in. To control my own sugar consumption amount and type, I opt for Unsweetened so I can add my own sweetener. I’ve found honey can be difficult to distribute evenly, but maple syrup stirs in nicely. For my toppings, I like to hit up the Whole Foods bulk bins and get a couple bags of whatever catches my eye. I’ll also frequently have various types of nuts and seeds on hand. And I almost always have a bag (or two…or three!) of granola in the pantry. For granola, I’ve been loving Purely Elizabeth. I currently have Cranberry Pecan in the pantry. The list is long, but it’s pretty clean! And did I mention this yogurt breakfast bowl is naturally vegetarian and vegan? So long as you use the right yogurt, of course. If you follow me on Instagram, you’ve probably seen this hack a lot recently. While you can fit more toppings if you use a regular bowl, when you’re feeling super lazy, don’t want to have more to clean up or haven’t done the dishes, you can use the yogurt cup itself. I like to give the yogurt a quick stir before adding the toppings. If using a separate bowl, pour yogurt into a medium bowl. Stir maple syrup into yogurt until evenly distributed. 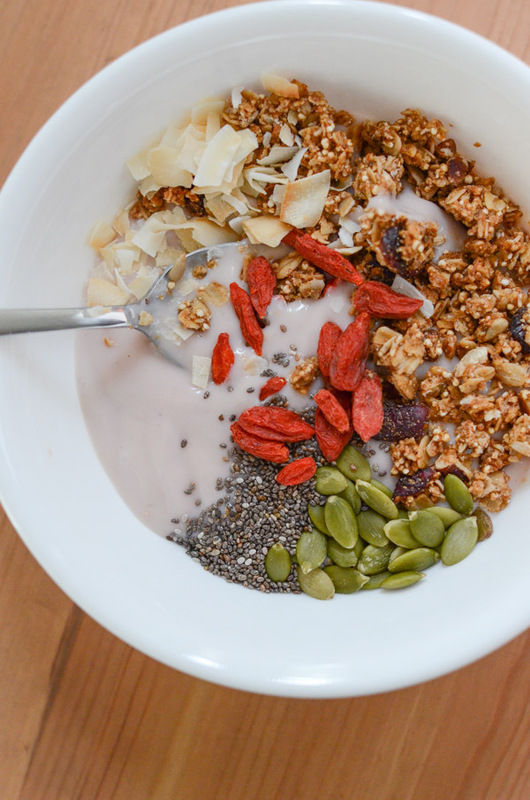 Add granola, coconut flakes, pumpkin seeds, goji berries, and chia seeds on top. Enjoy! Note: even though I consider this a “non-recipe”, I put it into a recipe so you have it in a printable format and can see how much of each topping I used. I eyeball the amounts each time, but this is roughly how much I typically add. 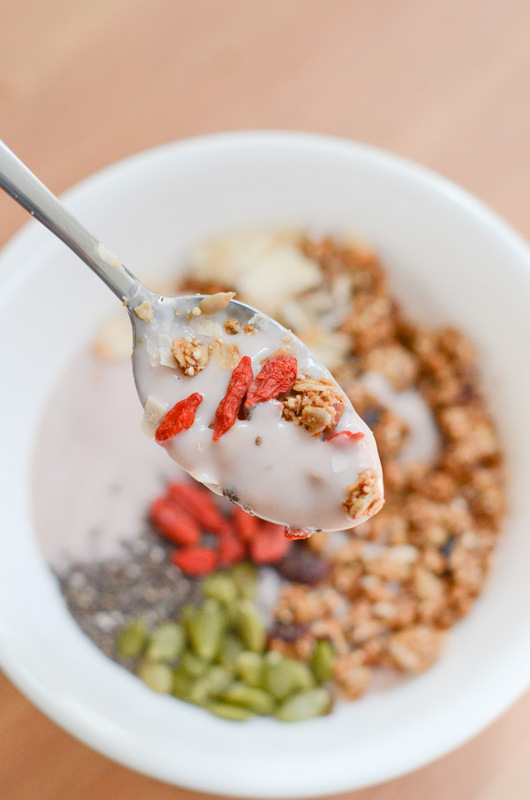 Hope you enjoy this 2 Minute Yogurt Breakfast Bowl post so you can take your yogurt to the next level and actually start your morning feeling satiated and energized!